This Chili had even my pickiest eater asking for seconds! This family has a longstanding legacy where chili is concerned. My dad's chili is the BEST recipe, bar none. He wins the chili cook off at church nearly every year. And even those who are initially skeptical of his heavy-on-the-sugar and hold-the-beans approach come around to loving it. And if you want the recipe... you'll have to go here. Because this chili is not that chili. Listen, my dad's chili is awesome. Amazing. Groundbreaking even. For a sweet tooth, anti-beans girl like me, it's heaven. Add sour cream and corn chips, and I won't be leaving the table for a lonnnnnng while, guaranteed. But my husband likes beans. And every once in awhile, for a reason unbeknownst to me, I oblige his weird taste. My family recently moved, and we lived on freezer meals for a while during the transition. I stayed up until 2am one night making 20 freezer meals... everyone called me a maniac, but it totally saved our butts for more than one weeknight dinner! TOTALLY worth the late night. Instead of cherry picking different freezer meal ideas from Pinterest, I went with one of those all-in-one articles titled something like "20 freezer meals in less than an hour!" Well. It took a lot longer than an hour. But this recipe was on the list, so I'm not complaining. Because this chili is so good. My husband loved it, of course, because of the beans. I was super impressed by the depth of flavor from the garlic, the chili powder, and even a little sweetness. Going from freezer to slow cooker broke down the beans and incorporated them into the mixture more than you'd normally see in an average chili recipe. All very notable to my husband and me. But the real clincher was my daughter. My daughter (with whom we have waged a dinner-time table battle for all of her 6 years of life) RAVED about it. Shoveled it down. Asked for seconds. And when I asked why she didn't mind eating all the beans (after the second bowl of course, I'm not a total idiot), she simply shrugged and said, "I dunno. It's just so good." Y'all. I have watched this child projectile vomit across the table from a single bean triggering her gag reflex. In short, I'm telling you this recipe is nothing less than a Christmas miracle in July. If that child can gobble it up, you KNOW it's something special! 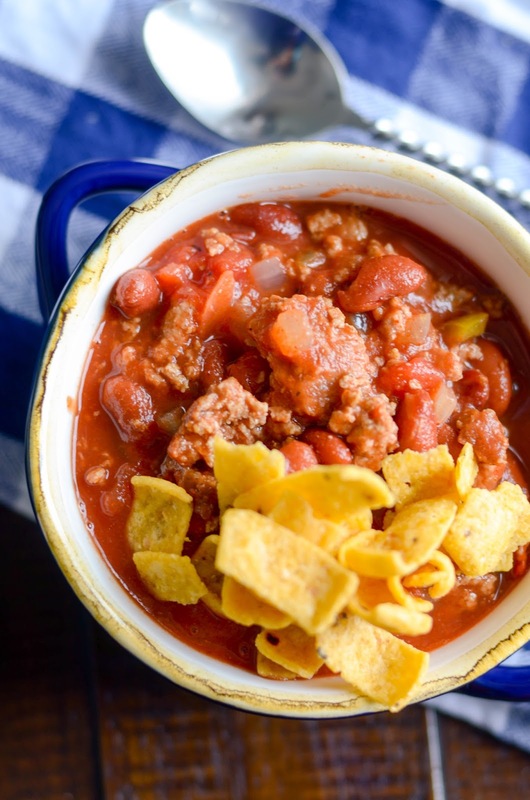 So, while I can't ever turn my back on the bean-less, brown sugar-y chili I grew up on, we have definitely started including this one in our dinner rotation a lot more often. 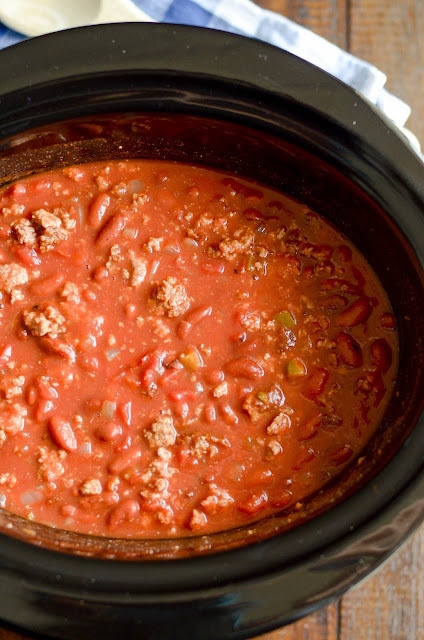 Next time game-day rolls around, toss your stuff in the crockpot around lunch time. 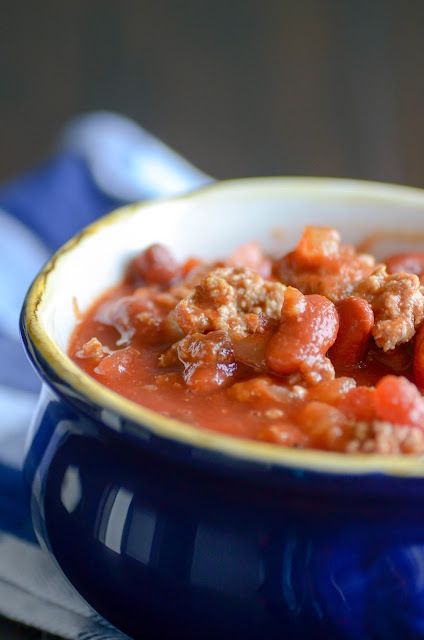 By dinner, you'll have a perfectly seasoned, robust, mouth-watering chili ready to go. And don't forget the corn chips!! If making a freezer meal, place all of the ingredients in a gallon size freezer bag and store in the freezer until ready to cook. once read to cook (thawed or frozen), place in a slow cooker and cook on low for 6-8 hours. Top with cheese, corn chips, and sour cream!